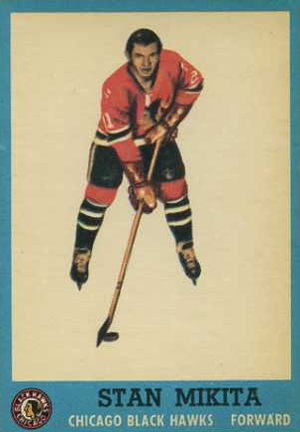 1962-63 Topps Hockey continued the practice of featuring a set broken down by team they began the previous year. They also continued to include coaches, team cards and a checklist card. For the first time, however, the cards were given a border that wasn't white. Cards feature a player photo superimposed over a solid white background. They have a blue field surrounding it. Below the picture, but inside the blue field, are a team logo, player name, team name and position. A black starburst design flanked by two cartoon hockey players leads the vertically oriented card backs. The starburst contains a card number, player name, position and team. Below that, a field of blue contains a single line of statistics from the previous year and a bilingual biography about the player. Topps only had rights to feature players from three teams for 1962-63 Topps Hockey. Each was partitioned off into its own section of the set. The Boston Bruins appeared on cards #1-22, the Chicago Blackhawks had cards #23-44 and the New York Rangers were featured on cards #45-65. The coaches for Boston and Chicago were the first cards of their teams' sections. Because New York was undergoing a change at the position, they didn't have a coach in the set. Team picture cards are the last cards for each section and a checklist takes up the last card in the 1962-63 Topps Hockey set. Key rookies in the set include Vic Hadfield, Jim Nielson and Chico Maki. 66-card set. Only players from the Rangers, Bruins and Blackhawks are included.